The Rotary Club of Oswestry and The Charlotte Hartey Foundation. 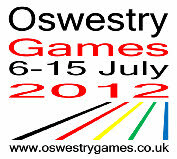 We are very lucky to have found some generous sponsors for the Oswestry Games. Without them, none of this would be possible. The Rotary Club of Oswestry and the Charlotte Hartey foundation have both given us substantial sums to make this event happen and we are very grateful to them both. The Oswestry LJC have also made a significant contribution. We have received grants from Shropshire Grassroots Grants and West Midlands Community Games. We are very grateful to David Moorcroft O.B.E. for the encouragement and support he has given us. Many local companies and private individuals have offered sponsorship in cash and in offers of goods and services to help us along. We would like to thank: TG Builders Merchants, Stans Super Store, Ascis Sports Shoes, Scotprint, Oswestry Picture Framing Company, WM Griffiths, Morris Cook Chartered Accountants, P&B Tyres, TPX Printing, Ballsports Community Coaching, Oswestry School, Oswestry Cattle Market, Cold Move, GTH Toolhire, The Oswestry Furniture Scheme, BT, Borderland Rotary and Pop Creative. Walford and North Shropshire College have kindly let us use their facilities for the Family Cycle Event on the 8th July and the Games Launch on the 6th. .
Special recognition must go to all of the volunteers in the local sports clubs who are putting on events in the Oswestry Games and who work, unpaid and unrecognised, year-in and year-out to provide sporting opportunities for the young people of Oswestry. We would also like to thank the local Arts organisations who have joined in with gusto!